Hairs are the essential part of the human body which gives the human a particular identity, looks, and style. Like skin, hairs are of different colors. It can be black, brown, blond, or even red or something in between like strawberry blond. When we put a single hair under a microscope and then we will see granules of black, brown, yellow, or red pigment. What we see under the microscope are small particles of a pigment called melanin which is the same pigment which gives skin its color. Inside our hair follicles, special cells called melanocytes are found which produce melanin, which is deposited in the middle layer which is called cortex, it is a three-layered shaft. Pigment continues to form in the hair cells of the cortex as the hair grows upward. Some hair follicles produce more pigment than others. Hairs of eyebrow are the darkest colored hair in the human body. Like our skin, hairs also have two types of melanin which are Eumelanin and pheomelanin. Where Eumelanin makes hair black or brown and Pheomelanin makes it red or blond. Only redheads or those carrying the genes for red hair make pheomelanin. Auburn-hairs are the result of pheomelanin which is nearly hidden by eumelanin and pheomelanin present in small amounts can make black hair shiny. Pigment production is affected by ageing. Caucasians who are blond in infancy usually produce darker hair as they grow older. The gray or white hair of old age are the result of a loss of activity in the melanocytes. In young age, an enzyme called tyrosinase breaks apart the amino acid tyrosine as an important step in the production of melanin. As people get older, less of that enzyme is produced, so less melanin is produced. Eventually, the hair shaft grows out with little melanin. What's left is the color keratin. 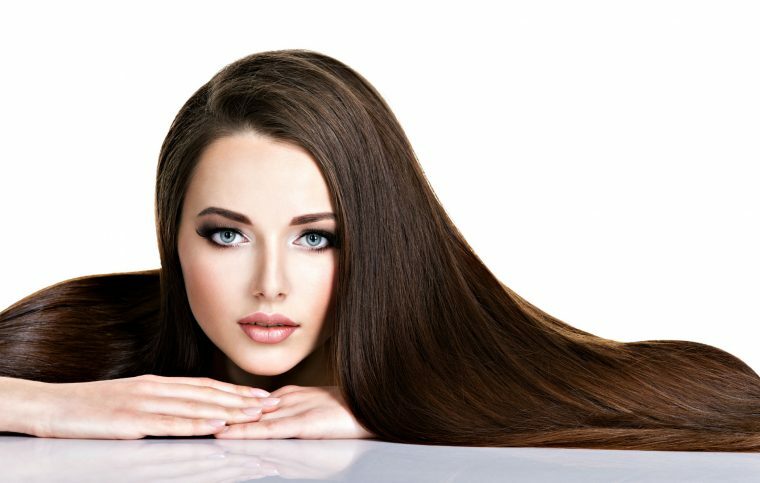 Keratin is the main protein which forms the structure of the hair shaft. Keratin without the combination of melanin looks yellowish gray. More the melanin in our hair, the darker will be its color. If people are born with light hair, it often gets darker with ageing. As we grow older, your hair will probably get gray or white. This is due to less production of melanin, so your hair starts losing its color, which makes them look gray. The total absence of melanin in hairs or in the body is called ALBINISM. It produces transparent follicles which are visible as white hair. The hair on the human head have a growth of about one-half inch per month. Which should be around 6 inches per year. Hairs grows faster between the adolescence and 30 years of age, and in women more rapidly than in men. Hair grows faster in summer than in winter. Melanin is made up of specialized pigment cells which are called melanocytes. They position themselves at the pores on the skin's surface through which hair follicles grow. Each hair grows from a single follicle. Anagen: This is the active growth stage of the hair fiber or follicles and can last from 2- 7 years. At any given time 80-85% of our hair is in the anagen phase. Catagen: This phase is also referred to as the transitional phase, which is when hair growth begins to “shut down”. It generally lasts 10- 20 days. Telogen: This occurs when hair growth is completely at rest and the hairs fibers fall out. At any given moment, 10-15 % of our hair is in the Telogen phase, this phase mostly lasts 100 days for scalp hair. After the Telogen phase, the hair growth process resumes again to the anagen phase. When the hair is being formed, melanocytes inject pigment (melanin) into cells containing keratin. The protein keratin makes up our hair, skin, and nails. Throughout the years, melanocytes keep injecting pigment into the hair’s keratin, providing it a colorful hue. With age comes a reduction of melanin. The hair turns gray and eventually white. With ever-changing lifestyles and food habits, people have become more addicted to fast foods, packed food items, fried foods, burgers, pizza and taking sugary products to have a bad effect on the production of melanin in the body which leads to premature graying of hair and other hair related problems. Premature greying also give stress to younger people. People start using different types of colors which contains very harmful chemicals which can even cause the allergic condition in some people or irritation to the skin. In Ayurveda hair are considered as the mala of Asthi dhatu and proper nourishment of Asthi dhatu also makes the growth of hair very healthy. In Ayurveda premature greying of hair is called palitya. 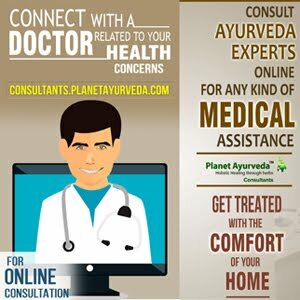 Greying of hair is a pure Pitta disorder that occurs due to the vitiation of Pitta dosha. This is why people with predominant Pitta constitution tend to have gray hairs earlier than others. Excessive Pitta present in the sebaceous glands which reside at the hair roots, called folliculitis can also result in hair loss and graying prematurely of hair. Pitta-provoking habits such as excessive passion, anger, and physical strain result in graying of hair. One must also avoid Pitta-genic beverages like alcohol, tea and coffee. Intake of spicy, oily, salty and sour, fermented foods along with meat can aggravate Pitta. But apart from being a primarily Pitta problem, the Vagbhata classified palitya according to the dosha predominance. Greying of here with ageing is a normal phenomenon but due to drastic changes in our lifestyles and improper eating habits which leads to untimely greying of hair. The stress and strain in our daily life have induced palitya (premature greying). Palitya is commonly seen piitaj Prakriti purusha or when pitta is predominant in our body or vitiated in the body. For maintaining healthy color and structure of the hair one should adhere to healthy life style and healthy dietary habits. Should take more green vegetables and fruits in diet. Fruits and vegetables rich in vitamin B complex, vitamin A, biotin and other minerals should be taken more frequently. Oil massaging hair is the oldest and the most traditional remedy for the extra shiny and soft stresses. You can either use olive oil, coconut oil or almond oil or bhringraj oil. Slightly warm the oil and massage your scalp thoroughly usually do it at night. Leave it for one hour before washing. Using olive oil is greatly preferred as it strengthens the roots and prevents hair breakage and keep their texture healthy. Massage olive oil on your scalp and leave it overnight for better conditioning and wash it in the morning. This is also the best home remedy to maintain healthy hair. One should avoid such a diet which is more pitta predominant or which vitiate pitta dosha like all spicy, fried food items. All these food items vitiate pitta dosha which decreases the ranjak pitta function and also combining with vayu leads to discoloration of hair which is called as Palitya. In Ayurveda, this condition is called palitya. At planet Ayurveda we have such herbal products which maintain the normal color of hair and prevent premature greying of hair. These herbal medicines encourage healthy growth of hair and maintain the normal requirement of vitamins, minerals and all other healthy nutrition which keeps hair healthy and shining. Amalaki Rasayana is an Ayurvedic medicine which is used for rejuvenation, aphrodisiac, immunomodulatory, and antioxidant properties. It is also very beneficial for the brain, eyes, heart, liver, skin and hair. It also improves the functioning and health of these organs. Amalaki Rasayana has antioxidant action and Vitamin C content, which fights against free radicals and reduces the signs of ageing and helps in slowing process old age. It has rejuvenating property. It also reduces a headache, blurred vision, burning sensation in the eyes, eye fatigue, eyestrain, irritated eyes, dizziness, double vision, etc. 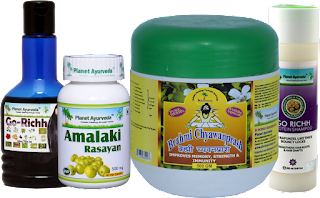 Amalaki Rasayana also very effective for gastritis, peptic ulcer, inflammatory bowel disease (IBD), hepatitis, skin problems, hair fall, and several other health problems. It is an herbal jam containing a unique blend of Amla (Emblica officinalis), Brahmi (Bacopa monnieri) and 48 other herbs. It boosts immunity, also act as an antioxidant and Rasayana. Brahmi Chyawanprash also enhances the functioning of the brain. It also helps in slowing down of ageing process. This shampoo is an herbal product made of herbs. It acts as a cleanser and soothes the scalp. It helps in keeping hair hydrated and maintaining their texture. Prevents hair scalp from fungal infection. It also helps in recovering from premature greying of hair, dandruff. It makes hair long, smooth, stronger and shiny.